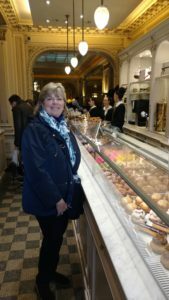 River Cruises Archives - CKIM Group, Inc.
Sue Murphy has been part of CKIM Group’s talented team for many years. Originally from the East coast, Sue is now based in Florida. Of course, she loves to travel in order to see how and where she should send her clients. 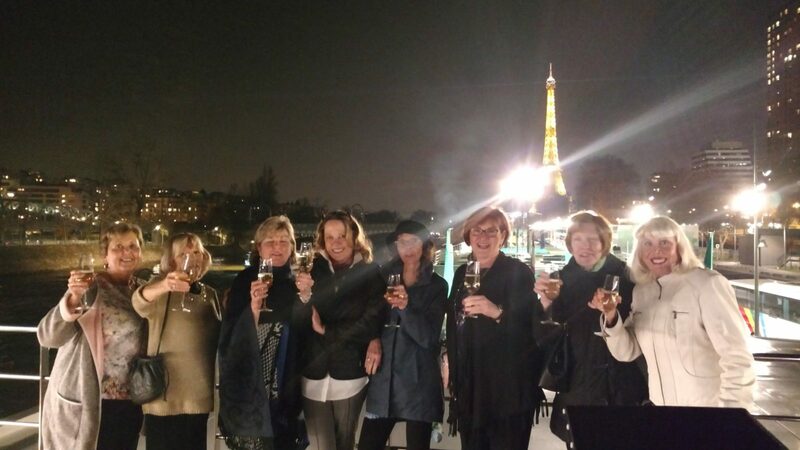 Last year in March, she arranged a trip to France for a group of women. She decided to call it the “Wacky Women Tour,” which was a great success. Here are her memories of the trip. How did you come up with the idea of Wacky Women Cruises? Picking out macaroons in Paris. I started to accumulate friends that were women who were either widows or divorced. So it just seemed logical to me to bring women together for trips. What I started to do early on was do cruises by myself and with a friend of mine. Most women traveling alone don’t want to worry. They want everything paid for, everything included. When I meet my friends for a drink, I don’t want to haggle over who is going to pay the bill and all that kind of stuff. So it just kind of seemed that I would do some group trips for women. With these trips, women know that they don’t have to necessarily travel with a buddy. Quite frankly I said that it could be a really good thing or it could be a nightmare, because sometimes women just don’t get along. And the age range was between 55 and 82 so we had a broad range of interests and financial abilities. Five of us went into Paris early so we had three days there which was wonderful. The other three women met us directly at the ship on the day of the start of the cruise. “Joie de Vivre” in Paris. Why do you like doing cruises? The nice thing about a cruise is you unpack your stuff one time, they take you to the next location, they plan the excursions for you, your meals are included. People think its expensive, but you’re not renting a car, you’re not driving around paying for gas, you’re not packing, unpacking your stuff and you’re not staying at different hotels. For my stage of life, it’s the only way to go. How did you like Paris? The Paris part of the trip was fabulous. The only issue was I booked a driver and a van to take us around Paris and the driver didn’t speak much English. I had to whip out my guidebook and do most of the commentary myself, but the next time, I will make sure to get a tour guide that speaks more English. I also planned a tour of the Louvre with a guide, because you could spend weeks in there. Another thing that we did was go to the Notre Dame cathedral, which we did during the overview trip, but three of us went back on Sunday and did the mass. That was just awesome. To actually go to Mass in Notre Dame is something that will never forget. It was in French, but the pamphlet they gave us, some of it was in English. If you go during a service, there are fewer people there. The service was at 8:30am. The doorman said to get there half an hour early because it might get crowded, but it wasn’t. So we got to walk around inside, take as many photos as we wanted, and there were no other tourists. It snowed at the beginning of the trip. 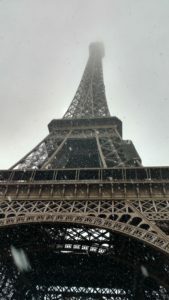 I also planned a tour of the Eiffel Tower which they cancelled, which was too bad because there were people on the trip who really wanted to see that including me. But to see Paris in the snow, for me, was just mind-blowingly beautiful. People had their umbrellas out, the cafes were still open, but most people were huddled inside. It was just spectacular. We ended up in Paris at the other end of the trip. When we got back it was in the high ‘50s, low ‘60s and all the flowers blooming. Why did you choose a Uniworld cruise? I picked Uniworld because it is an all-inclusive river cruise. The cabins are bigger and they offered single cabins. Most cruises don’t do that. Because of that, they only offer it during the not-so-busy season. Where else did you go on the cruise? 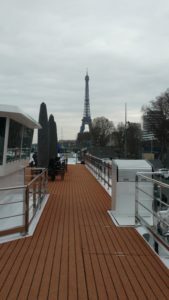 Onboard Joie de Vivre with the Eiffel Tower in the background. We started out in Paris. The first day we stopped at Giverny, where Impressionist painter Claude Monet lived and worked. It was March so all the flowers weren’t out in bloom yet, but they had a bike tour option, which was nice. We then went to Rouen and ended up in Honfleur, which is a little French village in Normandy that is absolutely charming. The architecture is so original, there are charming little café. We had some of the best mussels that I’ve ever had and the wine was wonderful. That was certainly a highlight for me. We went to the American cemetery. We had to take a bus there, and Uniworld provided every one of us with a rose to go and put by a cross. It was so moving. We stopped by the sculpture “The Spirit of American Youth Rising from the Waves” at the cemetery. They had someone from the military there to play “Taps” and do a prayer. And that was so meaningful. We ended the trip in Paris and had another day there. We chose to tour Versailles, which was exceptional. We saw a part of Versailles that very few people get to see. I think they limit it to 20 people each day that can see this part of it. That’s the advantage of a Uniworld trip: the tours are so exceptional and so are the tour guides. We had two birthdays on the trip. The last birthday, I think the woman was turning 55, we were actually docked in front of the Eiffel Tower. For her birthday, we went up on the deck. Uniworld was wonderful. The Maître D’ arranged everything for me. We went up on the deck. They had a table set up with champagne glasses. There was a waiter there who brought two bottles of champagne. They used a big sabre to cut the bottles and we were all lined up in front of the Eiffel Tower when they had the big light show. Birthday celebrations in front of the Eiffel Tour. I spent a lot of time trying to coordinate getting us down there in front of it. The Maître D’ told me “You don’t need to do that. You can see it from the top deck.” We were the only ones up there. How many passengers does a Uniworld ship generally carry? I would say 138 to 140 is the usual. Uniworld cabins are a little bigger. The thing to remember with these river cruises is they are all the same size, because they have to be in order to get through the locks. From one vendor to the other, it is going to depend on what they used that space for. What other amenities did they have onboard? In the back they had a small bar area and eating area. And they had a pool. It was small but they had one. It is important to note that when we arrived at the hotel in Paris, we had access to a Uniworld rep at the hotel. So it was like having another concierge service besides the one offered by the hotel. So she would recommend places and she rode on the bus with us to the ship. What else did you do on the cruise? 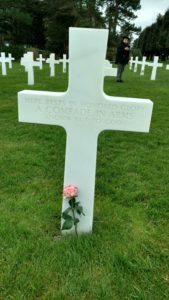 A grave at the American cemetery in Normandy. There were different excursions. Not everyone wanted to do the same thing and some of them had been there before, but we made sure we had cocktails and dinner together every night. And I was able to get the same table and the same waiters for us every night. And we were loud. There was one other group of women onboard of the same size. It was obvious that we were having a good time. At the beginning of the trip, I came up with a group of questions, and every night at the dinner table, there was one question we all had to answer. Questions like “What was on their bucket list?” “What is the best meal that you’ve ever cooked?” So every night at the dinner table, there was conversation. Because I wasn’t sure if they would get a long or not, so that helped get things going. And of course, we talked about what we experienced every day. That was one of my questions as well, “What was the most inspiring thing that you saw today?” And that was a nice way for people to share their experiences. The other thing about it was the ship. It was called “Joie de Vivre”. It was, at most, a year old. Each Uniworld ship is different and the décor is very opulent. I think the opulence can be a bit off putting to men, but for women it is terrific. There was a great private cooking class onboard. That was just exceptional. It was in a beautiful room with a wine pairing for each course. I mean you didn’t do a lot of cooking, but we helped chop stuff up. When we walked in, there was a folded apron and a hat that said “Joie de Vivre” on it, so everyone got their own custom aprons and hats. It was an amazing experience. Was there other entertainment onboard? There was but it is minimal compared to the big ships. They might have a singer come in. They always have a piano player onboard. They also always try to bring in what is local cuisine and wine. Every evening, about 6:30pm, you go up to the cocktail hour in the lounge and whoever is in charge of the festivities, he comes in and tells you all about what you are going to see the next day, what the excursions are about, what the schedule looks like and they usually offer a big slide show of the things you are going to see and do. Especially in Normandy, they spent a lot of time talking about the war. On a river cruise, there is only one restaurant so you eat in the same place every night. If you’re looking for restaurant choices, bar choice, entertainment, you won’t get that. It’s a different kind of cruise. The other thing about river cruises is they are very intimate. There will be 150 people onboard and by the time the cruise is over, trust me, you know at least half of them. You get to know people, where they are from. If you are an extrovert, you are in heaven. If you’re an introvert, it could be a little bit of a challenge. It’s totally different from a big ship experience. On river cruises, you are docked in the town. So you can do your excursions in the morning and if you want to go back to a museum, or have a fabulous lunch or whatever, you can. And you can usually walk or they will have a shuttle for you. So you are more immersed in the culture that you are in. For more information on Sue’s Wacky Women Cruise Adventures, feel free to reach out to Sue at sue@ckimgroup.com. The very popular luxury river cruise company Viking River Cruises announced the next phase of its $250 million fleet development program as it unveiled details of four new vessels for its 2012 sailing season. 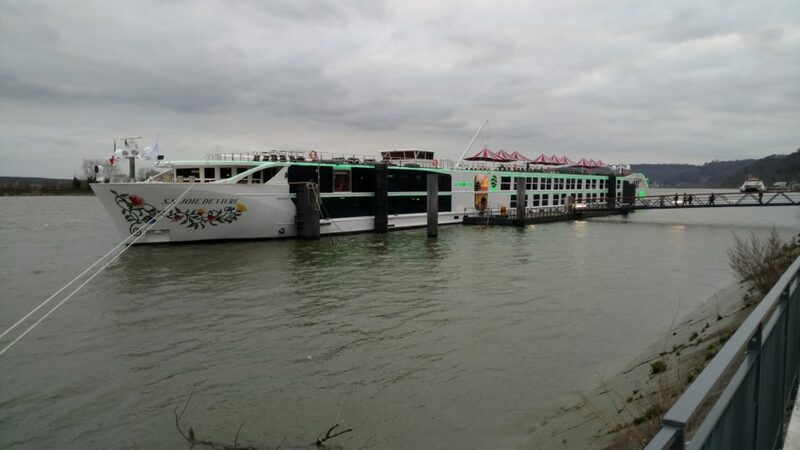 These will be the next generation of river cruise boats, Viking Freya, Viking Idun, Viking Njord and the Viking Odin.